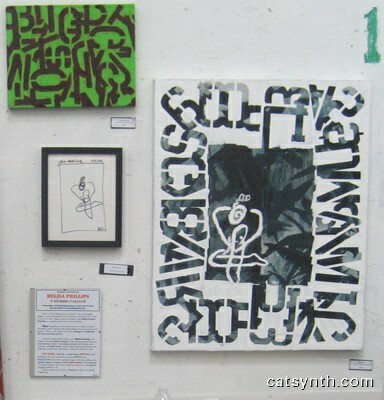 Just as it was last year, Open Studios is “art overload” – the sheer number of artists and artworks can be quite overwhelming, even just concentrating on a few studios in a small number of blocks in the Potrero Hill and Mission neighborhoods. 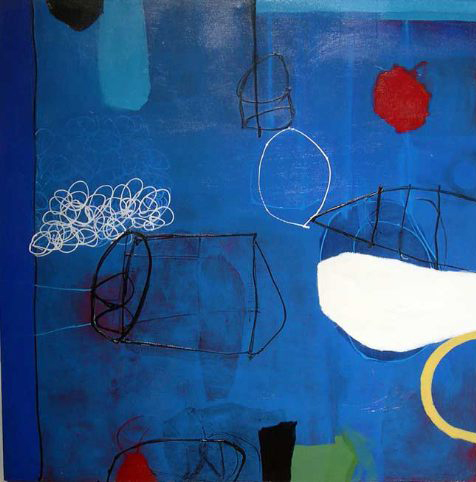 I concentrated on a few areas of particular interest, such as pure abstraction, conceptual work, urban landscape, and use of technology, but also took notice of other themes such as animals (especially cats) and selected figurative works as well. 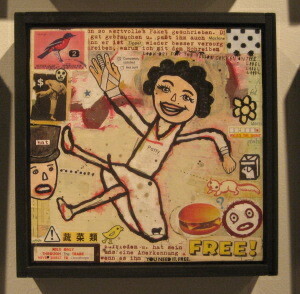 The first major stop was Art Explosion Studios on 17th Street (they now have several locations). 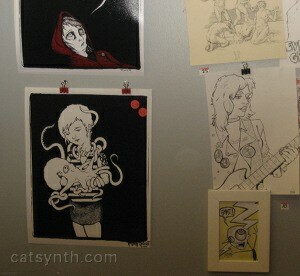 I usually begin by seeking out larger abstract works (such as might be appropriate for the walls of CatSynth HQ). These could be single large paintings, or collections of smaller objects to form a whole. 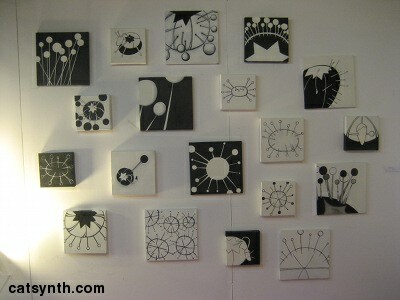 An example of the latter was Kally Kahn’s black-and-white “pincushion” series. Very abstract and geometric, I did not immediately recognize them as pincushions until Kahn pointed it out. The brought to mind science fiction or microbial illustrations, and as such I thought of Miro’s Constellation. The coloring and texture also reminded of Julia Orshatz’s work I had seen a week or so earlier at First Thursday, although Kahn’s pincushions were rounder and less intricate. In terms of larger abstract canvases, Heike Seefeldt’s Roller Coaster series stood out. 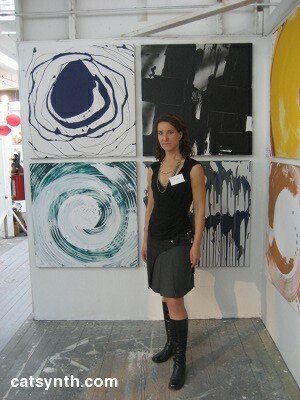 Each 3-foot square canvas featured a central color and set of shapes (e.g., spirals, radial patterns, stripes, etc). 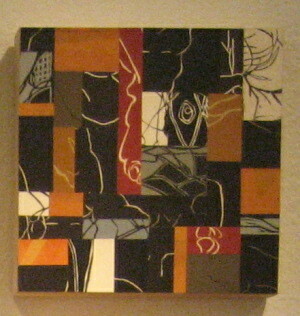 Most made use of bright colors, but the Devastation sub-series featured darker colors, including one distinctive black canvas with more rectangular shapes. Michelle Champlin’s large canvases featured cityscapes that were imaginary but were inspired by real cities, such as San Francisco. At least one painting featured an outline of the Transamerica Pyramid; another was supposed to represent a neighborhood like the Tenderloin as seen at ground level and incorporated newspaper clippings into the background. Champlin said she was inspired by the cosmopolitan nature of the cities, and the coming together of many different people with different perspectives. Jhina Alvarado’s stark Forgotten Memories series was based on old photographs she collected. 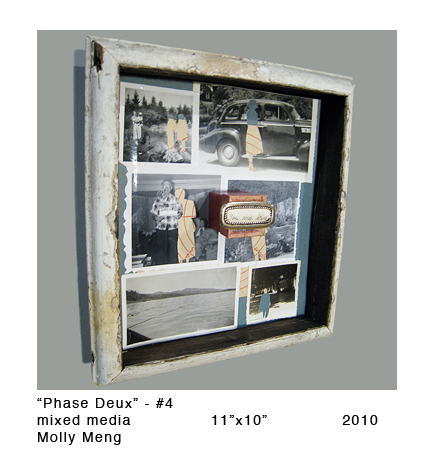 It seemed odd to possess “other people’s memories”, which led her to create these series where the people were presented on empty backgrounds, and their eyes covered with black boxes. Alvarado suggests that blocking out the eyes added anonymity, as well as some mystery to the figures, and to separate them from the memories of the original owners of the photographs. Interestingly, some Alvarado’s work was displayed into the main hall next to another series of paintings in which the main figure’s eyes were hidden. Romolo R Nisnisan Jr’s In the eyes of a hakujin included a large portrait of a blindfolded Asian woman, supposedly a caricature of western mens’ perceptions of Asian women (or at least that’s what the poorly worded artist’s statement suggested). On my way to Art Explosion, I stopped at a small studio on Potrero Avenue, featuring paintings by Calixto Robles. 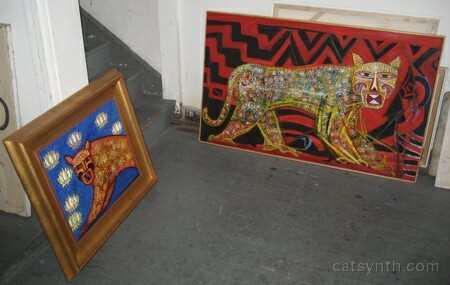 Several of his large paintings feature iconic and stylized images of jaguars. Most were singular portraits like the examples above, although Robles sometimes incorporated them into other pictures with dreamlike or religious imagery. At 1890 Bryant Street, I met Sevilla Granger. 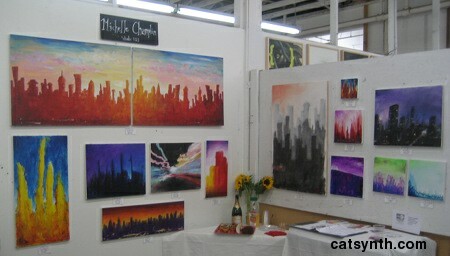 Most of her canvases feature trees in silhouette surrounded by warm colors. The trees often have sharp bends in their branches and patterns reminiscent of the cypress trees along the California coast. Interestingly, these “arboreal portraits” are sometimes painted over initial abstract layers of paint that are never seen except as texture beneath the surface. She actually presented one of these preliminary images as a finished work, and found that it received a very positive reaction. Catherine Mackay’s paintings focus on the “visual urban experience”, and her new series Wharves and Warehouses continues this theme. 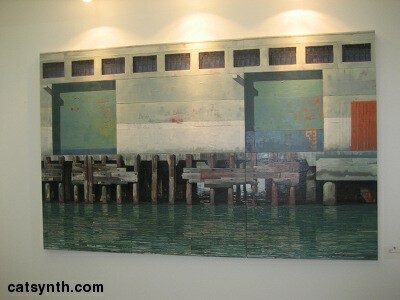 I had seen Mackay’s work before, which featured familiar locations from San Francisco and New York. Unlike her previous paintings, which featured very think paint and strokes that obscured the industrial quality of the scenes, the current series is very finely textured and almost photographic in some cases. I instantly recognized one of the piers from along the Embarcadero near the Bay Bridge, an area which has been a rich source of material for my own photographs – this led to an opportunity to share some of my own images and discuss our experiences with the urban landscape. While some artists focused on a particular media, theme or technique, Mr. Rogers was focused on a single character “Bunnymatic.” As the name implies, bunnymatic is a sort of robot/bunny character, inspired at least in part by the characters of Sanrio (e.g., Hello Kitty, etc.). 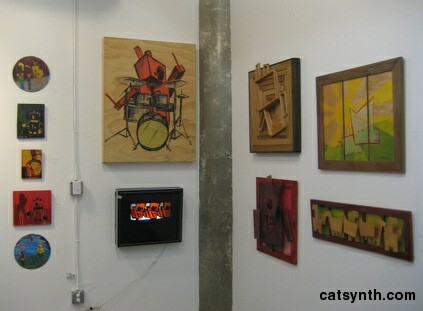 We see bunnymatic in a variety of media (painting, graphics, popsicle sticks, kinetic sculpture) and in a variety of situations, such as playing drums, partying, towering over a skyline, etc. Another comic/cartoon-like image that caught my attention was this one illustration by Matt Delight, featuring a young woman and her pet mollusk. A block or so away was Project Artaud, which houses a warren or live/work artists’ spaces, studios, galleries and a large performance space (where the 2008 San Francisco Electronic Music Festival was held). 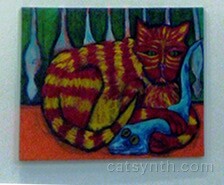 Around a corner, I came to the studio of Janet Scheuer, whose colorful paintings feature cats. In particular, they feature her cat who passed away at the venerable age of 21. In another corridor, I heard electronic music coming from the studio of Saiman Li, where a small group was performing live. The walls were covered with a variety of objects, photos and conceptual works relating to Asian visual imagery and Asian identity. I made a brief detour to Cellspace. I mostly know Cellspace as a performing arts venue rather than a place for visual art. I did see large black abstract sculptures by Corey Best in the main hall. I also saw a few minutes of a dance performance entitled “Happenstance of Social Blunders”. Basically, it seemed to be deliberately clumsy dancing, set to some light jazz music provided by a live band. Silvia Poloto. Observations in Deep Blue. 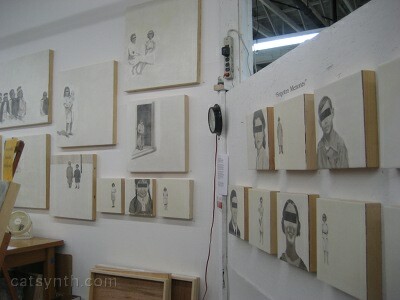 After Cellspace, I visited the private studio of Silvia Poloto. 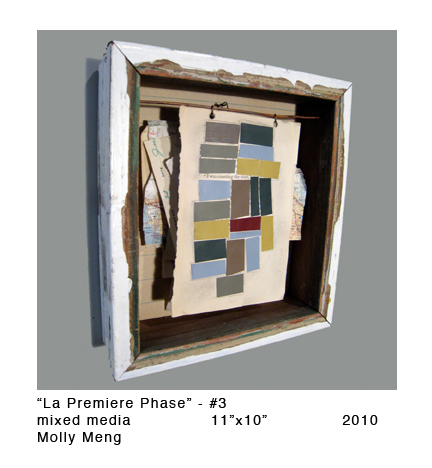 I have a small mixed-media piece of hers, and have always liked her very deliberate arrangements of geometric shapes, color fields, organic elements and the occasional snippet of text. Her studio, like her canvases, was clean and smart and organized and was well suited for displaying some of her larger works. 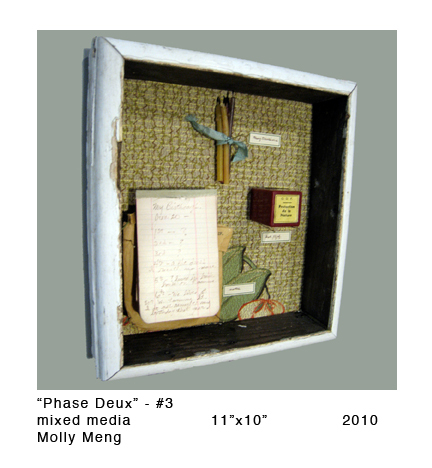 Some, such as the blue painting from her Observations series, resemble that original small piece and have a the look and feel of a rough drawing. Others, like those in the Absense Presence series are very smooth and polished, and divided into sections with abstract shapes or photo-realistic elements in each. A third series, Highland, appeared to combine both styles into a very tall narrow dimensions. From Poloto’s studio, I wandered down Folsom Street to Workspace, Ltd., a large and inviting collection of studios in a converted old industrial building. Perhaps one of the most unique collections of work I saw was that of John Zaklikowsi. His source materials are a combination of discarded electronics (hard drives, cell phones, etc. ), gears and chains, and musical instruments, which he arranges into large and intricate sculptural works. 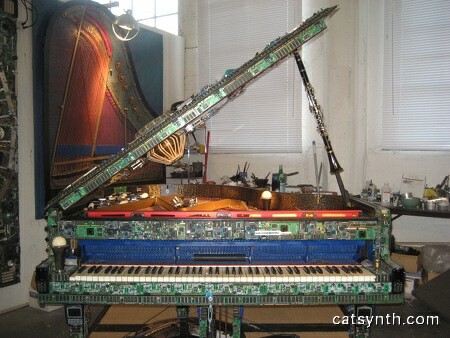 Some are flat wall-mounted collages, including one titled Number Theory; but he also had a grand piano covered with electronics and embedded with flutes, a clarinet and even a tabla. I did not try to play it. 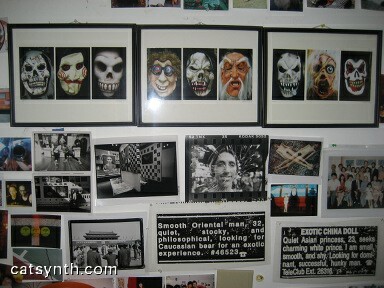 The corridors and studios of Workspace, Ltd also featured a variety of more conventional work. Leslie Andelin’s The Big Bang was a huge canvas covered in rectangles. The bright greenish colors are not really my preference. I did like the industrial and abstract paintings by Amy Curkendall and Alex Zenger, with lots of straight lines and angles. Ali Saif had a large collection of darker abstract canvases, mostly black and silver, with bits of red and other colors – his titles suggested industrial themes like classic cars. As 6pm approached I did find a place to “decompress” from the artistic and sensory overload. Delfina Piretti had set up a tent as a quiet space where people could compose images from their dreams. While I mostly just wanted a moment without any additional input, I did contribute a drawing, trying to unload a bit of everything from all the different themes and trends into a single image. I left it behind in the book, unlabeled and unsigned.